Last time there was an introduction to the overall anatomy of the pancreas, its basic functions and some of its diseases. Today we will go into a bit more depth but still keep it relatively simple. Acinar cells. They are found in clusters that sometimes resemble bunches of grapes. In the diagram the blue spots represent the nuclei (where DNA is kept). However, these are actually found on the side of the acinar cells that does not face into the duct (i.e. the basal side; the apical side faces into the duct/lumen). Ductal cells. These line the ducts through which the digestive enzymes – produced by the acinar cells – pass. Centroacinar cells. A small group of cells that reside at the boundary of an acinus and a duct. Alpha cells. Produce the hormone glucagon, which opposes insulin and raises blood glucose levels. Beta cells. Produce the hormone insulin, which decreases blood glucose levels by stimulating the uptake of glucose into muscle and fat cells. Delta cells. Produce the hormone somatostatin, which opposes a lot of other hormones in the body and, in particular, can slow down digestion. Gamma cells. Produce so-called pancreatic polypeptide, which regulates secretion of other hormones in the pancreas. Epsilon cells. Produce the hormone ghrelin, which is also known as the “hunger hormone” and signals to the brain that the stomach is empty. 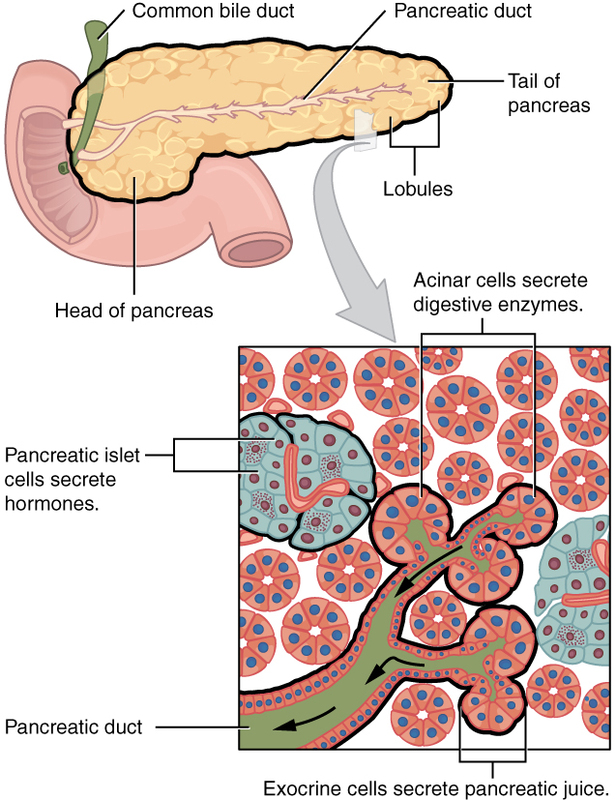 Overall the two parts of the pancreas perform complementary roles: the exocrine pancreas helps to physically digest food coming from the stomach, whereas the endocrine pancreas makes sure that the glucose released into the blood due to the digestive processes is used/stored properly. Secondly, people who are not scientists sometimes ask me how we actually study both normal and disease processes in the lab. Focussing on pancreatic ductal adenocarcinoma (PDAC), here is a brief overview of the systems used in the lab to gain a better understanding of what is going on in human disease. The easiest system to use are so-called (pancreatic cancer) cell lines – these are cells that were once taken from a patient and then cultured in the lab (in vitro). So although they are originally from a very relevant biological setting, the continuous culturing in the lab means that they are no longer physiological. For example, they grow in flat sheets on plastic trays, do not interact with any other cells and often have mutations that go above and beyond what is found in a real cancer. However, they allow relatively quick, controlled experiments to be conducted and are therefore still indispensable. More recently there has been a surge in research involving (pancreatic) organoids. These are mini-organs that are functionally closer to the real organ being studied and also have three dimensional structures that are more physiological. However, they need to be kept in relatively specialised conditions and are a little bit more tricky to manipulate than the cell lines. Since it is impossible (for a lot of reasons, including ethical ones) to conduct experiments on humans, cancer biologists most often turn to mice since they are also mammals and are genetically similar to us – we share approximately 90% of our DNA sequences. Mouse models of cancer allow complicated, intricate and biologically relevant experiments to be carried out, but they do take more time and need to be planned very carefully. Guerra & Barbacid (2013) have written a review specifically on PDAC mouse models. Data from human cancer biopsies. Increasingly, as sequencing whole genomes is becoming cheaper and easier to do, labs use DNA sequencing data from patients to compare some of their results from the mouse experiments. Biopsies can also be used to look at the histology (micro-anatomy) of certain stages or types of cancer in humans. In the end, these techniques are used together, since all of them have strengths and weaknesses, allowing (hopefully) the most accurate description of what is going on in a certain (disease) scenario. This entry was posted in Factual, PhD and tagged anatomy, Cancer, Cell biology, cell lines, mouse models, pancreas, pancreatic cancer, PDAC, stem cells by Victoria Wang. Bookmark the permalink.